It wasn’t just black and white. It was black, white, latino, Asian, young and old. It was families. It was students. 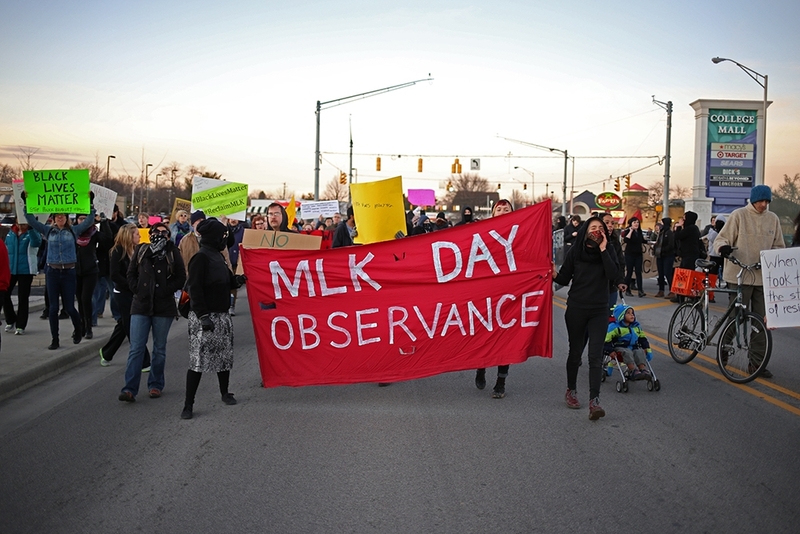 A protest against racism and police brutality stopped traffic Monday evening in honor of Martin Luther King Jr. Day near the intersection of College Mall Road and East Third Street. The demonstrators met at 4:30 p.m. in the parking lot of O’Malia’s at the corner of East Second Street and College Mall Road. The protest was dubbed “Reclaim MLK,” referring to Martin Luther King Jr. and his stand against racism and police brutality during the civil rights movement. The event was organized in response to recent killings of African Americans by police, specifically Michael Brown, who was killed in Ferguson, Mo., and Eric Garner, who was killed in New York City. The event was a “coming together” of community members, according to the event’s Facebook page. Stephanie Waller, a senior in the IU School of Social Work, brought a homemade poster to the event. “Direct action is immensely important to bring notoriety to issues that remain unaddr essed and unspoken about,” Waller said. By the time the demonstration began around 5 p.m., there were well over 100 people present and participating. They started by walking north along College Mall Road towards the intersection of East Third Street and College Mall Road, where they proceeded to fill the pedestrian crosswalks of the intersection, effectively blocking all traffic from driving through the intersection. According to an event flier, the traffic block was a planned aspect of the protest. Protesters began to chant in unison as someone played King’s “I Have a Dream” speech over a pair of portable speakers. Police arrived at the scene of the demonstration just minutes after traffic was stopped and stayed until it disbanded. No officers were willing to give a statement. Fireworks burned in the middle of the intersection. One protester lit a smoke bomb and dropped it in the street. Zola Lopes, a young girl who attends the Project School in Bloomington, was at the demonstration. “I would like to march for those who have been killed from police, all that has happened in the past 50 years and for MLK,” Lopes said. A small scuffle took place when police tried to subdue a man who was attempting to flee. Other protesters broke their formation to surround and protect the man but he was caught and handcuffed. After the protesters’ formation was broken, traffic began to move through the intersection again, forcing the protesters to move their demonstration south on College Mall Road. 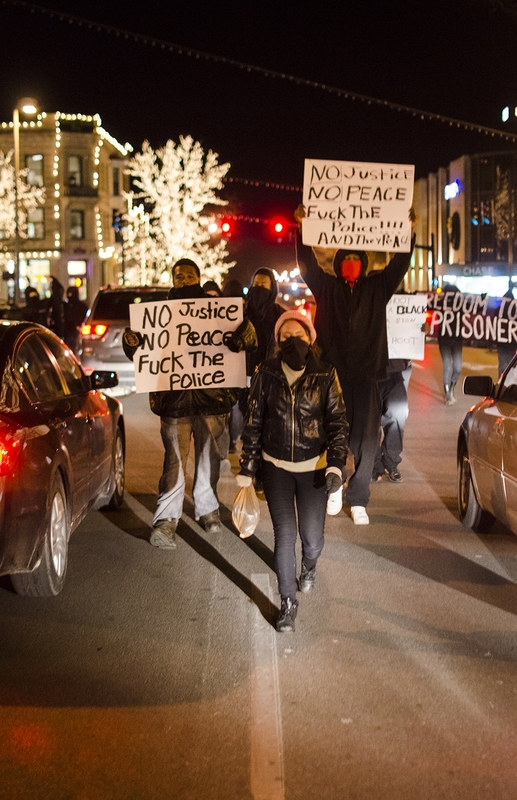 The protest ended at around 6:15 p.m. following a moment of silence. The moment of silence lasted for 4 1/2 minutes, symbolic of the 4 1/2 hours Michael Brown’s body lay in the street, said the woman leading the protest with a megaphone. Two men were arrested during the first event: Michael McConnell, 22, and Joseph Varga, 51. Both are residents of Bloomington, according to the Monroe County Correctional Center. A fund was started on the website youcaring.com to raise money to bail the two men out of jail. Some of the protesters regrouped later that evening for a second demonstration at 9 p.m. at People’s Park. Brochures and fliers were handed out at the first event, detailing the purpose of the event and what motives they had for stopping traffic.